Here is a list of the shortest women golfers playing on the LPGA Tour. As you can see from the list there are quite a few short professional women golfers. So being short is not that big an impediment for women playing golf. However, most of the short women on the list are not big winners on tour so being short might well be a handicap in terms of winning events. The average height of a woman in the United States in 2017 is 5' 4". All the women on this list of shortest women golfers are well below the average height. All women 5' 1" or less are listed with comments and then all women golfers who are 5' 2" are listed and a few other successful women golfers who are 5' 4" tall or shorter are listed. 1. Jeong Jang - 5' 0"
Jeong Jang from South Korea is an excellent golfer who stands just 5' tall. Jeong Jang was a rookie on the LPGA Tour in 2000 and since then she has won $6.7 million in prize money. Jeong Jang's biggest win was at the 2005 Women's British Open. She also won the Wegman LPGA event in 2006. She has also lost three playoffs on the LPGA Tour in her career. T-2. Porani Chutichai - 5' 1"
Porani Chutichai from Thailand stands 5' 1" tall and she has played in three LPGA events and missed the cut in all three including once in 2017. Porani now primarily plays on the Thailand LPGA Tour. She was the overall money winner on the Chinese LPGA in 2011 and she won the 2016 Yonex Ladies Golf Tournament on the LPGA of Japan Tour. T-2. Dana Finkelstein - 5' 1"
Dana Finkelstein from Arizona stands just 5' 1" tall but she is a rookie on the LPGA Tour in 2017 and so far she has won $40,233. Dana played golf in college for UNLV. T-2. Megan Khang - 5 1"
Megan Khang from the United States has a chance to be a very good professional golfer despite her height. Megan started playing on the LPGA Tour in 2016 at age 19 and she has earned $647,130 so far in her short career (no pun intended). T-2. Aretha Pan - 5' 1"
Aretha Pan from Malaysia has started six times on the LPGA Tour and has yet to make a cut. She will make her 7th start at the 2017 Sime Darby LPGA Malaysia. T-2. Jiyai Shin - 5' 1"
Jiyai Shin from South Korea is easily the best shortest golfer. Standing just 5' 1" tall, Jiyai has 11 wins on the LPGA Tour including winning the Women's British Open twice (2008, 2012). Her career earnings stand at $6.2 million. T-2. Kelly Shon - 5' 1"
American Kelly Shon has been playing on the LPGA Tour since 2015. Kelly has yet to win a tournament but has earnings well in excess of $500,000. She played in college for Princeton. T-2. Ai Suzuki - 5' 1"
Ai Suzuki from Japan plays on the LPGA Tour sporadically. She has played in seven events and made one cut. Ai Suzuki has won five times on the LPGA Tour of Japan with her most recent win coming in May of 2017. Cristie Kerr stands just 5' 3" tall but she's has won 19 times on the LPGA Tour and has career earnings of almost $20 million. 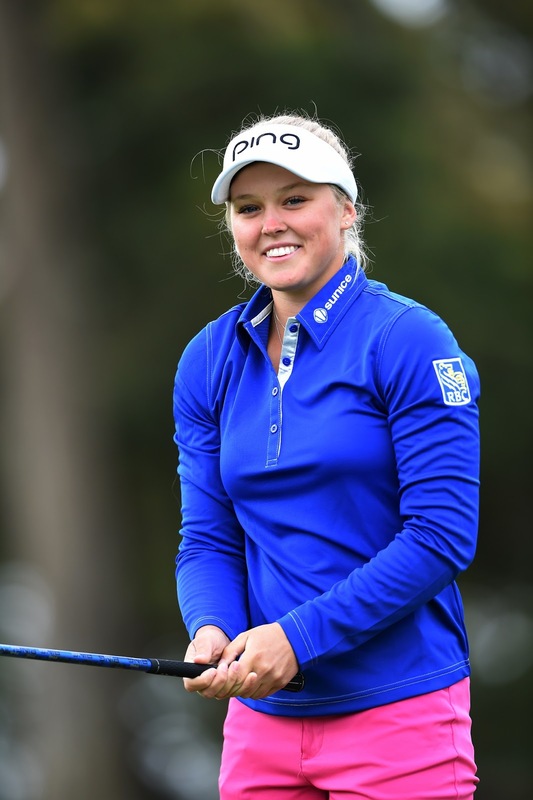 Brooke Henderson is average height at 5' 4" and she has already won 5 times on the LPGA Tour at age 20 and has earnings of $3.5 million.